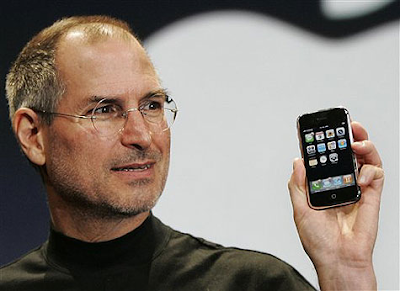 Peter Bryer: Mobile Foresight: Steve Jobs: not the nicest guy you'll ever meet. There should be more like him. Steve Jobs: not the nicest guy you'll ever meet. There should be more like him. I've come across several people over the years who had reported to Steve Jobs for some sort of Apple project or another. I've heard that he's demanding, hands-on, belittling, stubborn. In other words, the type of guy you want in charge of the company you work for if you aren't into the idea of standing on the unemployment line. This is a tough market. It requires tough decision makers. I've heard that Apple never uses consumer research or market forecasts. It came down to gut instinct for Jobs. Would there be an iPad today had Apple looked at market predictions made even the best analyst firms? No. Here's to gut instinct and those who have the guts to use it. Not many companies do. And here's to the man that probably cost me my job: Jobs.